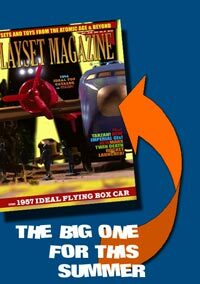 Issue 45: Ideal Flying Box Car! a fun way to kick off your Summer! Featured are the Ideal 1964 Catalog with color pages; Tarzan sets to keep things swingin', and those Mysterious Marx Rodeo Cowboys. These little charmers instantly became some of our favorites when Kath first saw them; their irresistible poses include a man calling from the fence, a rodeo clown, several cowgirls, and lots of cowboy and Brahma bull action. So what ever happened to them, and why were they never sold to the public? Find out in this issue! But that certainly is not all-- it never is! 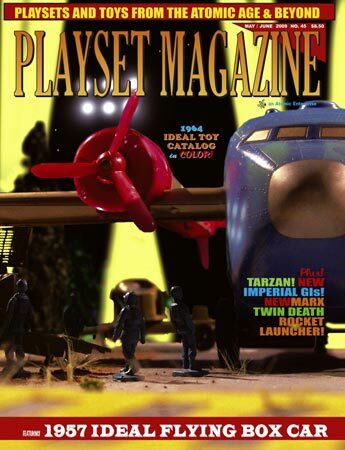 This issue we have the terrific bonus story of the Ideal Frogman Sub Launcher, a very special and action packed set that was the excitement of this editor's life as a kid. As a special bonus, we're adding a "How To Repair Your Frogman Sub" piece elsewhere on this website, an exclusive just for our readers. And then, there's the big, big, BIG story of a big, big favorite of the late 50's: The incredible, lumbering, awesome troop and material transport called Ideal's Flying Boxcar! We'll treat you to the real story behind this marvel of aviation and all the details of Ideal's miniturized version. But wait -- there's TWO versions! The Boxcar and the Globemaster -- How do you tell which is which? Which one got the most figures? Which had the plastic accessories and which sported vinyl? Ever seen it set up as a store display? It's 1958 VS 1964 right here on these toy-loving pages! Then there's MORE French Foreign Legin to let you down slowly off that Desert-Loving high you got from last issue and to help assuage some of our more advanced collectors of exotic and beautiful toy soldiers. And just when you'd think that's enough, there are toy show reports! Betty Ford won't let you feel left out with her repport from the Detroit Show, sponsored by Michigan Toy Soldiers, and Greg Urbach keeps you right up to date with the West Coasters Toy Show report. Did the economy hurt events? How are toy soldier sales? And what are we saying about it in the editorial pages? Plus Kathy is back with her popular My Side with another nice collectors toy room pictorial. And one last thing. We have been exploring the question about Blu-ray DVDS and playsers and Hi-Def TVs, if only because the moviews and TV were such an important part of forming our tastes and who we were back when. With today's economic prognosis, does it make sens to invest in the new medium? How do our favorite old movies look on high-def TVs? Are they really blotchy, showing too much detail in things like make-up? We think YOU want to know and its right here in part Two. - Plus news,Tom Stark's Puzzler, DioDrama, MediaWatch and much much more. - Classified ads, new production ads, and lots of colorful reading fun for Summer!